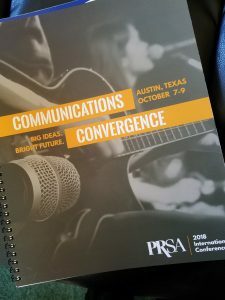 While attending PRSA’s International Conference in Austin this year, I thought how proud JJ&W’s founder, Patrick Jackson, would have been of all the conversations revolving around measuring behavioral outcomes and the PR practitioner’s role as relationship-builders and strategists… particularly at a time when our organizations, and our country, need these skills the most. 1. As PR Professionals, it’s our job to help organizations understand how their key audiences think – how to reach them – and motivate them to behave. Check out their website for more examples…including the “Teens For Jeans” partnership with Aeropostle.By the way – their original outreach for “Teens for Jeans” via email registered 89 volunteers – but their text outreach garnered 3,560 responses!Know what channels work best with your target audiences. 2. PR can help drive the “Purpose Beyond Profit” movement by helping organizations identify the causes that make the most sense for their business. In the “Digital Transformation of Communications” session, panelists discussed the fact that more than ever, CEOs and businesses are expected to lead change.Patagonia's very clear purpose of making the environment better and Starbuck's“Changing the World One Cup At A Time” campaign are two of many examples cited at the conference.Jonathan Mildenhall, marketing expert and former CMO of Airbnb, talked about the concept of “purpose driving performance”.He described how Airbnb took on the transgender discrimination issue with their “Mankind/Womankind/Trans-kind” universal belonging campaign.They used the triggering event of the ESPN ESPY Awards in 2015, when Caitlyn Jenner received the Arthur Ashe Award for courage, to launch the campaign.How has their approach impacted the bottom line, you ask?Airbnb now has 4,200,000 homes, 70 million guests and the company is valued at $31 billion. 3. PR has the skills to bring conflicting parties together and facilitate civil debate and “eloquent listening”. Stagnant Wages: Median wages since the 70s have not changed very much and there is a general frustration that “the system is rigged against us” – thus explaining the political gravitation to more extreme political figures like Trump and Sanders, who represent a move away from “politics as usual”. Media Stirring The Pot. The media is good at using anger, fighting and conflict as a way of grabbing reader/viewer attention. As a society, we’ve lost the ability to listen with respect and engage in civil dialogue. Reich says PR people can have influence not over the conflict of debates but over the tone of the debate. There is an opportunity for PR to showcase our trust and relationship-building skills…both externally (i.e. by engaging communities opposed to an issue) and internally (i.e. within our employee work groups), capitalizing on our counseling and organization development skills. 4. PR can help our organizations “break through the clutter”, by both using what we know about graphic psychology and utilizing emerging technologies. Fun fact from consultant Christopher Hannegin: 4 out of 5 Smartphone users check their device within 15 minutes of waking up in the morning. Yes…guilty here! According to Hannegin, we need to “tell the unexpected story” and “show familiar stuff in new ways”, incorporating the use of infographics when relaying complicating earnings data for our clients, for example.Stella Low, Sr. VP of Dell, urges us to continue learning about immersive technology and to consider how “virtual reality” and “augmented reality” can be used as new tools in the PR toolbox. 5. PR is worth its weight in gold during crisis situations. Prepare for multiple scenarios – and while you’re preparing the spokesperson, include your 2nd in command — needs backup! Conduct a lessons learned review – it’s an opportunity to fix what went wrong for next time – but also, to recognize what went well. Robin Schell, APR, Fellow PRSA is Senior Counsel and Partner at Jackson Jackson & Wagner, a behavioral public relations and management consulting firm based in the Seacoast of NH.For more information, visit www.jjwpr.com or email her at rschell@jjwpr.com. Whether you’re in charge of designing a rewards and recognition for your organization, or putting an awards program together for your industry, the question to ask yourself is: what behaviors are we trying to motivate? Teamwork? Employee retention? An above-and-beyond work ethic? Awareness? And the million dollar question: Is our current recognition program doing the job? A few years back, JJ&W was conducting an internal communication study for an airline client. One of the objectives was to get feedback from employees on how they felt about the client’s recognition program. Amazingly, one anecdote came up consistently in the 25 focus groups we conducted. It concerned one of the airline’s toughest financial years. At the holidays, the CEO sent a letter recognizing everyone’s hard work, along with two cookies, to each employee. Here’s what we heard from employees: “If you want to motivate us, don’t give us two $3 cookies in a $6 box…bring in lunch for our crew when we’ve been working 24/7 during a tough weather stretch!” If you don’t know how employees want to be recognized and rewarded …ask! A little research can go a long way in helping you to design an effective recognition program. Note: as a result of the research JJ&W conducted, the recognition program was revamped to include both individual and team awards, given that teamwork at an airline is a must-have behavioral goal. After all, we all want those pilots, gate agents and baggage handlers working together to deliver customer delight! 1. Evaluate your program…is it driving your behavioral goals? The Yankee Chapter of PRSA gives an award, originally known as the Yankee Award, but renamed for JJ&W’s founder and now called the Patrick Jackson Award. The Chapter asks its members to nominate professionals who are not in the public relations field but who successfully use public relations principles to benefit their organization and society, while demonstrating a track record of building public relationships that earn trust. Last year, Van Mcleod, former NH Commissioner of the Arts, won the award posthumously and joined a list of NH heavy hitters including Governor Walter Peterson, Bishop Gene Robinson and former NH Charitable Foundation president Lew Feldstein. The whole idea behind the award is to educate those outside our profession about what PR is and what it looks like when it is done well. The award has been in place since the 90’s, and rather than just keep giving the award, there is a committee in place to evaluate its effectiveness – are we getting the behavioral outcomes we want? Are we educating NH’s senior leaders about the value of PR by giving this award? 2. Consider filling a niche that doesn’t exist. Think about scholarships – there are many schools with awards for financial need and sky-high GPAs. When my high school scholarship committee got together to design the criteria for our class scholarship, we decided to go for a new niche and reward the “slow starter that finished strong”. When we are screening applications, we’re looking for the person who turned the corner in the latter half of their high school career, balancing GPA with work, outside interests and public service. 3. Design an industry award that gives back to the profession in some way. At our 35th anniversary (over 30 years ago! ), Jackson Jackson & Wagner established the JJ&W Behavioral Science prize with a donation of $35,000 to the PRSA Foundation. The intent was to honor an individual behavioral science researcher whose scholarly work enhances the understanding of the concepts and theories that contribute to the effectiveness of the public relations practitioner. Since JJ&W’s focus is behavior change, this research is an important foundation to the work we do for clients. Pat Jackson coined this type of giving “enlightened self-interest” — you do good for others but it reflects positively on your organization as well. The winner is honored at PRSA International Conference, with the idea they will conduct a professional development session based on their work, so conference attendees can all benefit. Note: the award is not given every year; just when the awards committee finds a deserving candidate. A final thought: if you’re on the receiving end of a prestigious award or recognition, don’t stop at issuing a press release to announce it – go direct to the audiences that matter most. When I earned my APR back in 1991, JJ&W notified our clients directly, and I got some wonderful hand-written notes of congratulations from fellow PR practitioners and friends acknowledging this accomplishment. As a measure of how much those meant to me … I still have them in my possession today, all these years later. Robin Schell, APR, Fellow PRSA is senior counsel and partner for Jackson Jackson & Wagner, a behavioral public relations and management consulting firm. For more information about Jackson Jackson & Wagner, visit our website at www.jjwpr.com. For years, JJ&W has counseled its clients, often anxious to rush out the door of external communication with whatever news they have, that their first stop needs to be communication to any internal audiences affected by that news. It’s the priority. And it’s common courtesy. Period. And we don’t stop with asking them to communicate with their employees – all of their employees, including the part-time flight attendants in the airlines, the cafeteria workers in the schools and the receptionists (especially the receptionists) at the desks of the Fortune 50 companies, who are likely going to be fielding the calls about the news when it gets out. Go deeper than that. In the case of the schools, think of your Board members, your parents, your alumni, your volunteers, your coaches of sports teams…even the vendors who are considered your business partners. There is an easy way to determine who should be told before the rest of the world hears the news. Think to yourself, if you were that employee, that volunteer, or that coach, wouldn’t you want to hear this from the organization you’re connected to before everyone else does? Given that as criteria, it’s truly bizarre why Disney and ABC executives did not figure out that Kelly Ripa – the co-host of “Live” – would not deserve the courtesy of finding out that her co-host Michael Strahan was going to be leaving the show to go full-time at Good Morning America, where he is currently working part-time, in advance of everyone else. Their rationale? “She’s going to be upset no matter when she finds out.” Perhaps, but what they forgot to think about was how they would feel if they were in her shoes and how much more upset she would be about the lack of communication and common courtesy extended to her in a place she has worked for over 2 decades. So she gave them some time to think about what they had done while she took a few unplanned days off, as they scrambled for substitute co-hosts and flew their highest-level executives in to deliver a personal apology. Kelly’s re-entry to the show today (on April 26th) was beautifully executed and appeared very genuine, and she delivered it to an audience that showed her the love and support she deserved with a standing ovation that went on until she finally shut it down to make her statement. After acknowledging in a very honest way that she had taken some time off to process the news and really think about what she wanted to say in response (with some humorous comments about ABC likely having snipers with tranquilizer darts if she went “off message”), she talked about the fact that this situation had started “a much greater conversation about communication and consideration and most importantly, respect in the workplace.” Amen to that! She went on to talk about her longevity with the show and that it was a place that felt like family to her. And all of us could imagine what it would feel like if family kept such an important piece of information from us. It wouldn’t feel good. She ended by acknowledging the personal apology by the parent company and the happiness she felt about the new opportunity for Michael – and he reciprocated with a heartfelt response. If there was tension there, it didn’t show, and they went diving into the entertainment portion of the show with their usual carefree back-and-forth banter. So it ended happily, at least for now. The proof will be in the pudding when her contract comes up for renewal. The lesson for the leaders of any organization – be it of a national television show, a corporation or a school – is really as simple as the Golden Rule. Treat others the way you would like to be treated. Period. Internal communication will always be, and should be, your priority for news that impacts members of your internal family.